Saturdays and Sundays are for kids this summer at The Reading Room and Le Carrousel. 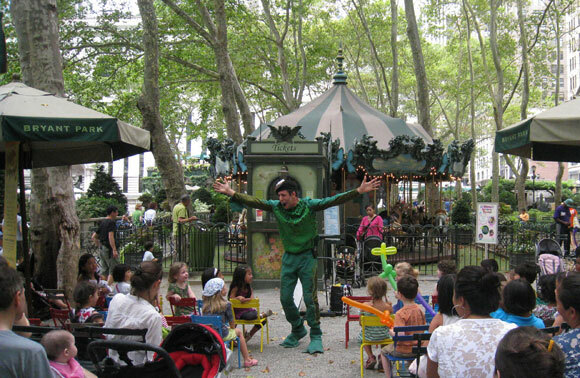 Beginning this weekend, Bryant Park's own Flaubert Frog entertains the little ones every Saturday at Le Carrousel. Kids will be delighted by his enthusiasm for performance, as he hosts special guests, directs the audience in participation, and brings stories to life with his off the wall exuberance. On Saturdays just before Flaubert performs, some of the best children's entertainers and story characters will treat adults and children alike to music, crafts and more over at The Reading Room. 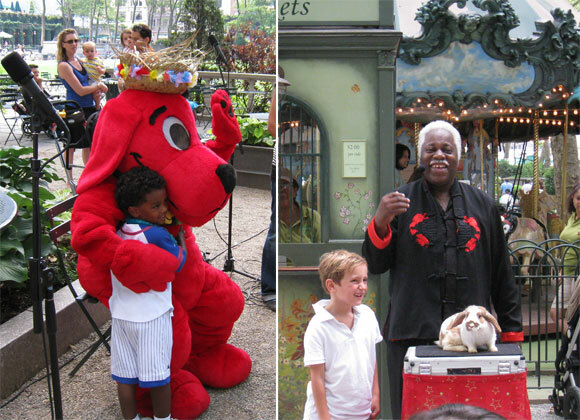 Check out the schedule for appearances by the likes of Starfish, Clifford the Big Red Dog and Bad Kitty. Then come back on Sundays, starting next weekend for Le Carrousel Magique, which returns to Le Carrousel with tricks that are sure to amaze. Magicians bewitch visitors with optical illusions, slight of hand magic, as well as rabbit appearances and disappearances. Pair any of these free activities with a ride on Le Carrousel, which is open every day 11am-8pm. Go for a spin with a $2 ticket, or get 10 rides for only $15 with a Frequent Rider Card, which never expires. *In observance of Independence Day weekend, no events will be held on July 2 or 3.